I’m working on a lifestyle overhaul. I feel that I’ve settled for the life everyone expected me to live – the house in the suburbs with the kids, and “settling down” to raise a family. None of this is necessary to live a truly fulfilling life with children. Buying a house is for suckers, and staying in the same place for several years at a time isn’t necessary for raising intelligent, happy kids. Hubby and I have been denying our adventurous spirit for far too long to comply with other people’s expectations of what our life should be. We’re ready for a change. We’re ready to embrace our identity as an Out-of-the-Box Family. The first step in my lifestyle overhaul is to make sure I’m in the best health of my life. Only when I’m healthy and alert, can I ensure that those in my care are healthy also. 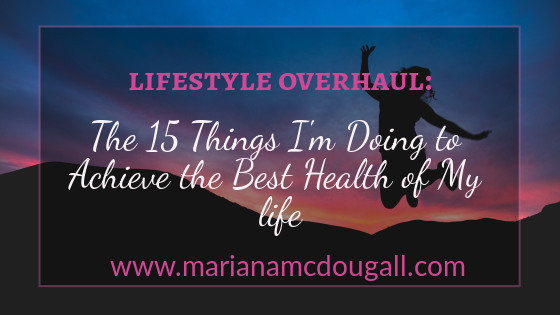 Here are 15 steps I’m taking to reach the best health of my life, all based on real research on what determines the health of a person, according to the World Health Organization as well as the Public Health Agency of Canada. I’ve taken the liberty of re-wording and expanding on the social determinants of health, so I can apply them to my life, and achieve my best health yet. Here’s what I’ll be working on. It’s a 15-step process and there’s no deadline; some of these will take longer than others. They’re all interconnected and intertwined, and working on one will often improve another. 1. I’m getting off my behind and getting active. It’s embarrassing that I used to be a personal trainer, considering how inactive I’ve become. From being busy with kids to pursuing a writing career, to not having enough hours in a day, I’ve used every excuse in the book to not be active. But I’m changing all that, and I’ve already started. Sometimes it’s hard to motivate yourself to get active, but it’s worth it. Exercise has been shown to prevent or even reverse several chronic health conditions, and considering I have three of them (asthma, hypothyroidism, and arthritis), I better stay on top of the game if I want to stay healthy for a long time to come. I’m motivating myself by signing up for a sprint triathlon. That’s how I motivated myself last time I wanted to be more active. Since it’s the off-season right now, I’m starting from scratch, as I’ve been inactive for far too long. I’m doing the Couch to 5K program and starting with very basic bodyweight training. I’m also swimming 3 times a week. I’ll be adding spinning soon—because there’s no way I’ll be biking when there’s a foot and a half of snow out there! I’ll be posting my resistance/strength workouts, so stay tuned, and maybe you and I can be virtual exercise buddies and keep ourselves accountable. 2. I’m enjoying food – in moderation. I am not a disciplined person when it comes to food, especially when it comes to junk food. I have a vicious sweet tooth and a terrible habit of not listening to my satiety cues. I also have the food association habit, which I’ll talk about in a later post. I’m going to break free from all that. This being lent, restraint should hopefully be a bit easier… I’m trying to fast, even though, as a breastfeeding mom, I’m no required to do so. I’ll be totally honest and say I’ve found it super hard to fast and haven’t really done a true fast yet….but I’m working on it and I’ll get there. I’m not restricting myself from any particular foods (other than meat, as I’m a vegetarian, and dairy, as my little nursling is allergic. Well, I guess I’m restricting myself). The point is, I’m not dieting, I’m simply watching my portions. I’m also trying to practice mindful eating too. More on this on a later post. 3. I’m cleaning up my physical environment. The physical environment has a huge effect on health, especially for me, as I have environmental allergies. I’m severely sensitive to perfume (it triggers my asthma, post nasal drip, and it makes my throat scratchy), and I’m allergic to dust mites. I’ll be the first to admit that there’s a crapload of dust around my house—I raise three young children and write on the side; who’s got the time to clean? But I definitely notice that the dirtier the house gets, the worse my breathing and post-nasal drip get. So I’m going to be making time to clean the place better, and involve the kids in the process… chart making time! We’ll be doing that this week. I’m also going to get outside more often – cold be darned! 4. I’m doing what I can to improve the lives of others in my neighbourhood. Our social environment has an effect on our health. I am fortunate to live in a good neighbourhood and to have everything I need, but others in my city aren’t as fortunate. Helping to change their social environment is a good thing, and it makes me feel good. I’m donating more to the food bank and ensuring I help my neighbours whenever I can (i.e. doing some extra shoveling in these getting-stuck-in-the-snow-prone days), thus helping to create a neighbourhood where helping others is a way of life. 5. I’m pursuing a rewarding career. For so many years, I viewed writing as nothing more than a hobby. But it turns out it’s actually one of the things I’m good at doing, and one of the things that I truly enjoy doing as well. I’ve decided to stop listening to the naysayers and pursue my writing anyway. I’ve already become an author on a popular multi-author site, and recently became a contributor for an online magazine. My real dream career is writing and selling books and/or online courses, but the exposure and earnings I’ll make from freelance writing will help me get there. 6. I’m embracing my identity as a lifelong learner. I almost always read nonfiction rather than novels. I’v recently realized that I prefer nonfiction because I enjoy studying. I don’t really miss the social aspect of university (it was hard to have a big social aspect when you were working two jobs while taking a double course load), but I actually do miss the studying and the learning aspect. 7. I’m dropping negative people. Social networks (and I don’t mean Facebook) are an important aspect of overall health. Having a group to rely on and be part of makes me feel good. 8. I’m cleaning up my finances. Hubby and I are pretty good with our finances. We have no debt other than the mortgage (which we are wondering why we got in the first place), and we’ve got about a month and a half of expenses as an emergency fund set aside. We did fall off the wagon getting that emergency fund to a 3-6 month status, though, so we’re back working on that again. After that, we’ll be re-evaluating the budget to see if we can get down to Brazil and see my family in this decade. I’ll keep you posted. 9. I’m choosing to understand and accept my dual cultural belief system. Immigrant children sometimes have an interesting blend of cultural beliefs. I left Brazil when I was 15, and although I am a Brazilian citizen and a Canadian citizen and embrace both identities, sometimes I feel like I’m neither Brazilian enough nor Canadian enough. Whereas in the past this made me feel awkward and inappropriate, I’m finally choosing to embrace this part of my life: I’m both Brazilian and Canadian, and I hope I’ve mixed the best aspects of both cultures in the way I live my life. 10. I’m doing those health things that women should be doing. Well, I’m getting there. I haven’t been doing self-breast exams, but I’m starting now. I’m working on pelvic floor health (because after 3 kids delivered vaginally, this just needs to be a priority), and I’m looking into ways to impact the environment less with that unfortunately unavoidable monthly visitor—the Diva cup is on the wish list, after I get those pelvic floor muscles back in shape. 11. I’m taking charge of my health care. I’ve been too accepting of not getting answers in the past. I have a few aches and pains and unexplained tiredness that have gone unchecked for too long. If my blood tests come back clear, this time, I’ll be asking for more tests. I won’t sit idly by while my health is ignored anymore. 12. I’m no longer using genetics to excuse my laziness. Whereas genetics affect health in a considerable way, too many of us use it as an excuse for our laziness (myself included). Yes, arthritis runs in my family, but my pain is worse because I’m currently overweight. and I’m currently overweight because I’ve been a lazy bum lately! Yes, most people in my family are overweight, but I’m overweight because I eat too much and exercise too little! Hence why I’m working on points 1 & 2. 13. I’m letting go of the past and making sure my kiddos live their best health. Childhood health affects adult health, but there’s nothing I can do about my childhood health. All I can do is address my needs now and help my children achieve their best health now, so they can continue living healthily in the future. Leading by example plays a big part in that. 14. I’m working on my spiritual needs. Prayer and reading The Word are a big part of my Lenten observances this year (as they should always be), but I’m viewing those practices with new eyes this year. And I’m learning to talk less and listen more in prayer. I’m also surrounding myself with those who have similar beliefs to mine, and who respect our slight differences. 15. I’m removing stressors from my life so I reach that zen state. The best way to deal with stress is to remove the things that cause you stress in the first place. I can’t remove my children, but I can change the way in which I respond (rather than react) to their needs. And I can certainly remove negative influences from my life if they’re stressing me out (see number 7). That’s a lot of stuff to work on for the best health of my life, but health is affected by many factors. Working on each of those factors will help me be in tip top shape – physically, mentally, spiritually, and socially. What are you doing to improve your health this year? How will improving your health help you achieve your dreams? Previous Previous post: Valentine’s Day? No thanks. Next Next post: FREE Beginner Exercise Routines – get off the couch and get active with me! Thank you for responding, Alyson; it’s an honour to have you visit my blog! I’ve been quietly looking around at World Travel Family and soaking in the inspiration.